Synopsis [c/o Barnes & Noble]: "When Barry Fairweather dies unexpectedly in his early forties, the little town of Pagford is left in shock. 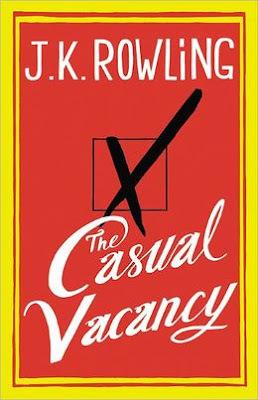 Blackly comic, thought-provoking and constantly surprising, The Casual Vacancy is J.K. Rowling's first novel for adults." Review: When I heard Rowling was publishing a new book for adults, I was full of both trepidation and excitement. How could my favorite childhood author switch from a world where anything is possible, to the average and ordinary life of regular human beings? And would I even like this new style? I put off reading The Casual Vacancy for quite a few months, but eventually couldn't resist any longer and decided to get it over with. With a humorous cast of characters faced with small town problems, it's very easy to relate to certain aspects of the novel, especially if you're from a small town yourself. While the main topic of conversation in Pagford is to get rid of the poorest section of town along with its drug rehabilitation center, there is much more to the level of animosity than that. The desire for power, to hide secrets, to rebel, or to present a front of perfection forces the characters into unpredictable confrontations. While the novel is superbly written, and is definitely entertaining, be aware that it is decidedly English. There were some parts that I could tell were supposed to be humorous that I didn't understand, or colloquial terms that went pretty far over my head. Combined with a cast so large it can be difficult to keep track of, the book isn't perfect but it isn't horrible either. Could be a good read if you like intrigue and watching housewives get what's coming to them. Good review! I was like you in my expectations of this book, but unfortunately, I really didn't enjoy it at all. Maybe I'm just too used to Harry Potter, but I was disappointed in the book. Oh well, such is life. Happy Sunday! I always love how you review books! Sounds like something I may add to my reading list, based on intrigue alone. I have been wanting to read this book, thanks for the review!